Stalfos have been around since the very beginning – in the original Legend of Zelda, they wandered in dungeons, waving their twin swords at Link as he approached. They evolved somewhat in Zelda II, wielding swords and shields against Link, and were the first enemy we encountered in that game that could block attacks. Their form shifted yet again in A Link to the Past, where they appeared in a couple varieties: a bouncing version that attacked either by leaping on you or tossing bones at you and a giant Stalfos Knight that fought with a sword and could only be defeated with Bombs. Since then, each of these varieties has reappeared in various other titles: the GameBoy and DS Zeldas stuck with the jumping Stalfos, while the early 3D games adopted one more like the Zelda II incarnation. 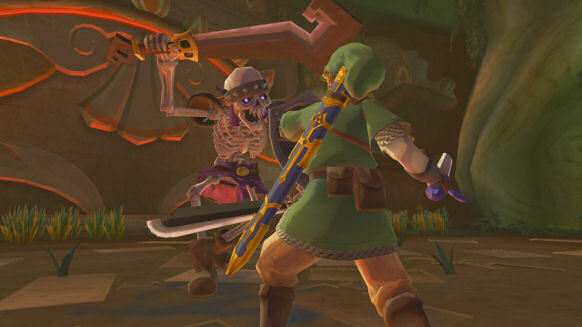 Wind Waker sort of took its own spin on the Stalfos Knight of A Link to the Past, giving the skeletal warrior a giant mace and allowing its head to be destroyed by any weapon after shattering its body. Twilight Princess returned to a more traditional form, giving the Stalfos back its sword and shield and its Bombs-only weakness. Some may dispute my declaration that Stalfos appeared in every Zelda game, since the enemy never appeared by that name in Majora’s Mask. 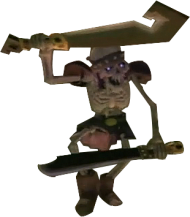 However, the skeletal knights who fight alongside king Igos du Ikana in the Ikana Castle fight in an identical manner to the Stalfos from Ocarina of Time, so for our purposes I see no reason to count them out. Skyward Sword looks to be taking the enemy “back to basics,” a phrase that could describe much of the game’s design choices and feel, by giving back its original double swords. This doesn’t mean it’s just going to wander around aimlessly as it would have in The Legend of Zelda, though – it’s been given all the intelligence and robustness of the Ocarina of Time incarnation. And, just as in Ocarina of Time and in line with many of the other enemies in the new Wii Zelda, to hit it you’ll have to swing your sword past its guard. It’ll raise its two swords in various patterns, and it’s up to you to deduce which direction to swing in. As far as we’ve seen they’re the only non-boss enemy to deal more than a single heart’s worth of damage (and in the demo, too! ), which bodes well for anyone worried about the difficulty level this time around. If you block their attacks with your shield at the right time, you can actually break off their arms – beware, though, since they’ll eventually re-form! Another variety will appear later on in the game that actually spawns two additional arms, presumably for more damage and more complex blocking combinations. We’ll have to see if this version appears in the E3 2011 demo so we can find out more. Check our Skyward Sword Walkthrough page for an in-depth overview of the Skyward Sword E3 2011 demo a week or so after the conference!